The Dalite 84 x 84" Designer Contour Electrol Motorized Projection Screen is great for any room, especially boardrooms, where aesthetics are important. 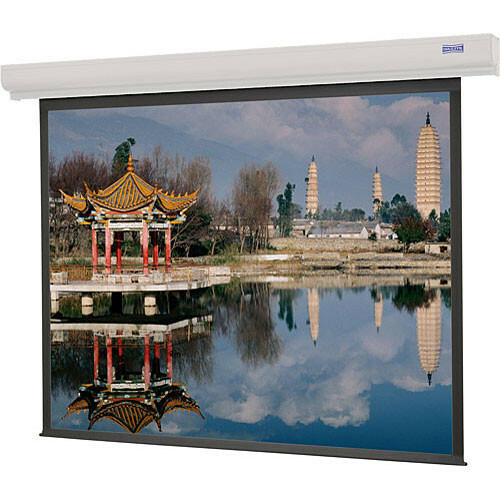 This reliable and fashionable screen features a built-in quality motor with a 3-position wall switch. The case is extruded aluminum and sleek measuring only 4.6 x 4.1" (HD). For those who prefer a more stylish finish to their case, a selection of various veneers is available upon purchase. The in-the-roller motor is designed to provide reduced noise during operation. This screen is available in a variety of designs and finishes to accommodate your venue. Note: An optional choice of seven veneer finishes is available for case. Standard veneers: Cherry, Mahogany, Light Oak, Natural Walnut, Medium Oak, Honey Maple and Heritage Walnut. Standard laminates: Cherry, Mahogany, Gunstock Walnut, and Light Oak. Cases covers with Honey Maple, Light Oak and Medium Oak finishes come standard with white base and end caps. Cherry, Mahogany, Natural Walnut and Heritage Walnut cases covers come with black base and end caps. Specify when purchasing. Box Dimensions (LxWxH) 106.0 x 8.0 x 6.0"